Downtown Kitchener was rockin’ Friday night. 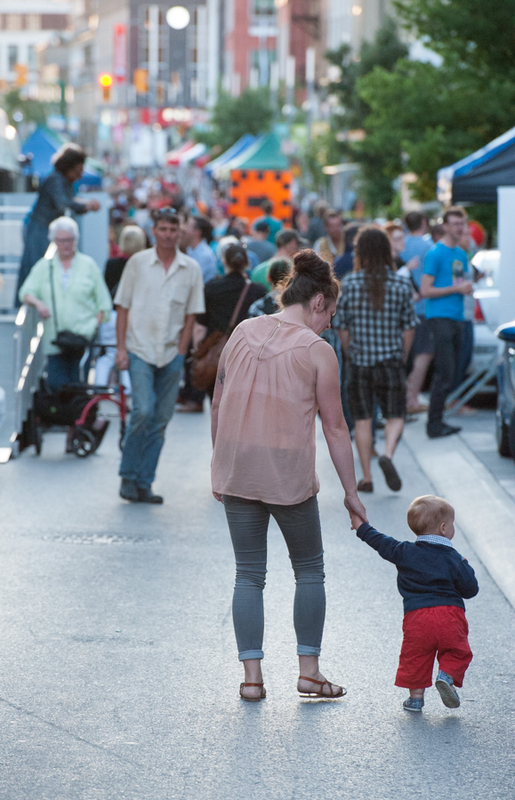 King Street was packed with people of all sizes for the Night Market. Seems like everybody is getting the hang of a pedestrian mall in the core. This type of gig is so chilled out. I love it. Rode my new bike from McPhail’s (yeah!) down to Kitchener and just strolled the street. Serendipitous chats with Mike Morrice, Jon Johnson, Jen Gough, James Bastow, Matt Scobel, a whack of perfect strangers, and saw my favourite Princess Cafe+Cheeses Murphy operator Marc Lecompte with family. A big shout out to Cory Bluhm who I saw setting up the event at lunch on my way to the Yeti Cafe, and he was still there tonight gettin’ ‘er done. More details on the ongoing Days of KWAwesome here. This entry was posted in event and tagged King Street, Kitchener. Bookmark the permalink.